Our Geneva collection combines simple elements and perfect proportions. 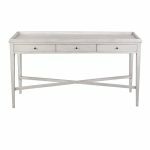 Showcased here is the Geneva 145cm console a handy addition to add a classic note to a room: the console table, with its slim proportions and airy elegance, is the perfect console table to sit in a narrow hallway, behind a sofa or even to pop your bedroom TV on. Finished in Mist Grey our beautiful new signature hand-painted patina that will sit perfectly into a modern or classic interior scheme. Geneva is coupled with raised sides on the tops, a simple but necessary design detail and the cross lower section sets the tone for the design, look and feel. This collection also includes a side table, 100cm and 122cm console. This is a new range and a limited amount of stock will be delivered end September. If you would like to pre-order please call a store near you.